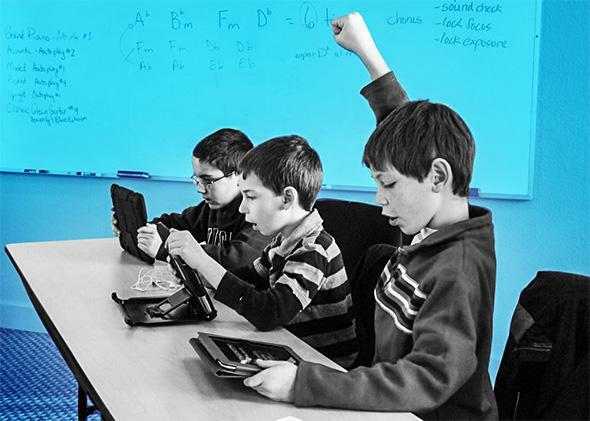 MIT’s Education Arcade promotes games, not gamification, in schools. Teachers predominantly use games as rewards or reinforcement, rather than starting points for learning. Photo illustration by Slate. Photo by Brad Flickinger/Flickr. But these optimistic, play-loving game gurus have come to despise the biggest buzzword in their field: gamification. According to Osterweil and Klopfer, both MIT professors, gamification too often means “making a game out of learning,” in which players win points, magical powers, or some other reward for practicing math, spelling, or another school subject. Klopfer and Osterweil argue that the best educational games capture what’s already fun about learning and make that central to the game. Gamification undermines what they see as the real opportunity for games to radically, albeit playfully, transform education. The arcade, part of MIT’s Scheller Teacher Education Program, partners with schools, gaming companies, and nonprofits to make educational video games. The staff also trains teachers to make their own games and to weave them into lesson plans, via on-campus courses and a new massive open online course, “Design and Development of Games for Learning,” that launches Wednesday. In gamified math, equations are often wedged into high-energy video worlds with wacky characters, points and player rankings, and maybe some explosions. It’s a model used by many popular educational games, such as Math Blaster, which has sold millions of copies and been reissued several times since it was introduced in 1983. Whenever the arcade team brainstorms a game, by contrast, it starts by finding people who are passionate about math, history, science, or any other subject and asks what drives and engages them. For instance, Education Arcade is now piloting The Radix Endeavor, a free, multiplayer online game designed to supplement high school math and science lessons. Based on conversations with working scientists and engineers, the game has players explore a fictional world called Ysola that’s ruled by evil, science-hoarding overlords called the Obfuscati. Players encounter Ysola’s beleaguered citizenry and embark on various quests while evading the Obfuscati, such as finding a cure for a deadly disease or using math to reinforce dangerously weak buildings. A few years ago, Osterweil distilled what he calls the “four freedoms of play,” including freedom to experiment, freedom to fail, freedom to assume different identities, and freedom of effort (meaning the ability to mix full-throttle effort with periods of relaxation and disengagement). For Osterweil, these freedoms are about more than good game design. The problem isn’t just the drill-and-practice design of many games, according to Klopfer. It’s also that teachers predominantly use games as rewards or reinforcement, rather than starting points for learning. Along with games, the Education Arcade creates optional lesson plans, online forums, blogs, and one-day teacher training sessions, all to help bridge game learning with other classroom instruction. Mark Knapp was teaching biology in the Boston public schools in 2012 when he heard about the Education Arcade’s plans for Radix and volunteered to be one of the teachers who helped with the game’s development. Knapp said Radix isn’t a substitute for the science curriculum he covers. What the game does do, he said, “is get kids interested in how scientist think and solve problems.” Since 2014, Knapp has been teaching kids with special needs in grades six through 12, and continues to use Radix in class.